A tie tack or pin is a fashionable addition to any outfit. These are the most economically priced options of our custom-made arrowhead jewelry and are perfect for gifts. The Arrowhead Tie Tacks are available in all the material type and style options offered (viewable HERE ), and range in size from 1" to 2 1/2". A foreshafted arrowhead and a 2" Arrowhead are also available with a pin back. Broochs are available with a Metallic Arrowhead version as well. 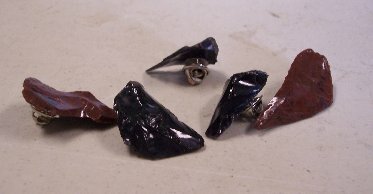 &nbp; The knapped items will have a shipping delay of about a month. 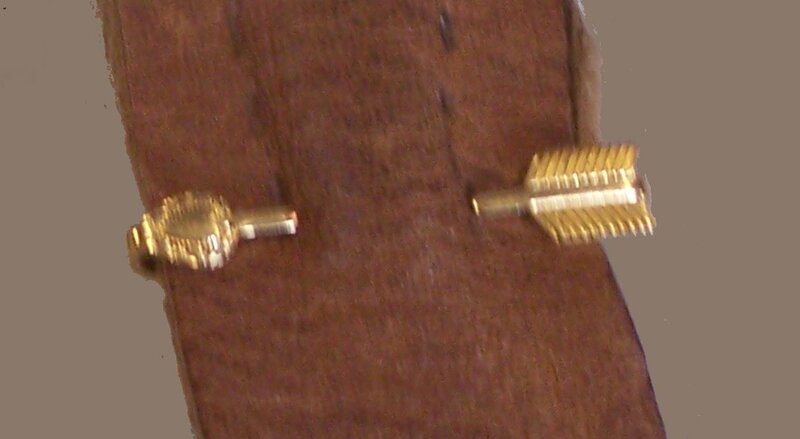 The Tie Tacks we offer have an arrowhead attached to the front of a metal pinch clasp backing like shown to the right. These pins have Two Inch Arrowheads with a safety pin type backing glued on their backs. The Foreshaft Pins have a smaller arrowhead tied to a foreshaft with a pin backing attached to the wooden shaft. This arrow shaped gold tie clip is for a narrow tie. A simple decorative tie tack which has a variety of flakes attatched to the front of a metal pinch clasp backing.